Seniors with Alzheimer’s or dementia may show anxiety or agitation through fidgety hands. Signs include pulling or rubbing at clothes or bedding, rubbing hands together, twisting fingers, wringing hands, and generally keeping hands in motion. Sensory therapy or fidget toys are an effective way to reduce anxiety, calm nerves, and provide comfort. These are simple touch-based activities that help someone with Alzheimer’s keep hands busy in safe, soothing ways. We’ve got 6 suggestions to help your older adult stay calm and comforted. It’s important to find activities that are safe. 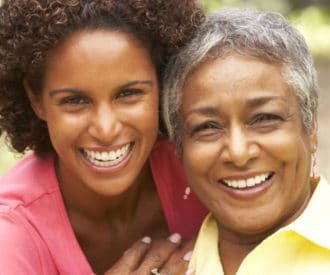 You know your older adult best and can choose what works best for them. For example, some older adults tend to put things in their mouth. If that’s the case, avoid small objects that could become a choking hazard. Other seniors may like to tie strings around fingers (or necks!) and restrict circulation. If that’s true for your older adult, avoid anything with long ribbon or string. DailyCaring tip: For a quick DIY fidget blanket with minimal sewing, start with a fluffy bath towel or large piece of soft fleece and securely sew on a variety of embellishments. Browse the ready-made ones above to get inspiration! Smooth crumpled tissue paper – get some colorful tissue paper and crumple each piece. Show them the crumpled pieces and ask for help smoothing them out. It’s easy to make your own fidget box or basket. Pull out the box when your older adult needs something to do and throw everything back into the box when they’re done. 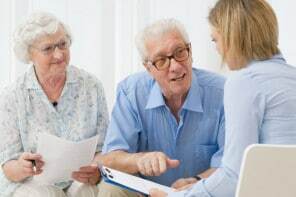 Some seniors are comforted by keeping a familiar item with them, like a purse or wallet. Fill an old purse or wallet with a few dollars, coins, play money, or faux credit cards so your older adult can rummage through whenever they like. No matter what the activity or toy, just remember that the goal is to engage your older adult in something fun and keep their hands happily occupied. There’s no right or wrong way to do it and no specific goal to achieve – whatever feels good to them is perfect! I work with a lady with dementia. And we are having issues with her putting her hand down her pants. And she is sun downing she gets two to three hours of sleep a night. We have given her things to do with the hand but she will put whatever is in her hand and go down her pants. It’s a nostop thing. What can we do? It’s possible that there’s a good reason for her behavior. It might be a good idea to have a doctor examine her to make sure she doesn’t have any skin irritation, a urinary tract infection, or another type of infection. Assuming she’s well and doesn’t have any valid reason for putting her hand down her pants, this could be caused by a variety of factors, including boredom, the need for comfort, or inability to regulate sexual impulses due to cognitive changes. My parents are in an Assisted Living facility. My dad is in bad health and needs rest, my mom has dementia and is constantly moving things around the room preventing him from resting. She does not want to participate in provided activities as she does not want to leave my dad. It is becoming a difficult situation. We tried giving her puzzles and coloring books, but she has never been an idle person and can’t just sit, plus she has macular degeneration and arthritic hands, so it is difficult to do crafts, writing, etc. Any suggestions on how to keep mom busy and give her some purpose will be greatly appreciated. That’s definitely a tough situation. 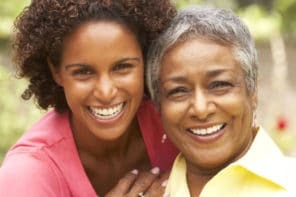 We’ve got a few articles that may be helpful in engaging your mom and giving your dad a chance to rest. You’re very welcome! I’m so glad this information is helpful. Hi- Thanks or the GREAT information!!! This will REALLY help me in my profession! Do you have a mailing list to put me on by chance?